Trees lining city streets, in public and private gardens, in parks, and in patches of urban woodland do a lot for cities. They help mitigate air pollution, lessen the urban heat island effect, provide flood control, and contribute a host of other benefits. Some studies have valued these ecosystem services at almost USD $1 million per square kilometer per year. And it turns out that these trees, collectively known as the urban forest, also contribute more than you might imagine to carbon sequestration, according to a new study published in the journal Carbon Balance and Management. Read Acre for acre, urban trees can store as much carbon as tropical forest by Sarah Deweerdt at Anthropocenemagazine. The United Counties is looking at a broad set of tools, including land control laws, in a bid to stop the dwindling forest cover. SD&G Planner Alison McDonald presented the plan to a committee of the whole session of county council this morning (Thursday). “The balance is shifting…perhaps shifting too far,” McDonald said, noting the cover had dropped below 29 per cent in 2014 and below the widely-held benchmark of 30 per cent. Part of the problem, McDonald explained, is land owners are secretly clear-cutting forest or filling in wetlands ahead of applying for a permit to build a subdivision or proceed with other developments. “Landowners are getting savvy,” knowing there are few people on the ground to catch them. Read SD&G exploring controls to halt depleting forest at Cornwall Newswatch. Read Nice shades: 7 Fast growing shade trees to slash your electric bill by Derek Markham at Treehugger. Urban forests play a vital role in helping communities adapt to and mitigate climate change, reduce air pollution, sequester carbon and save energy through natural heating and cooling. But urban forests are facing increasingly difficult growing conditions. Exotic pests, more frequent and severe storms, and the loss of soils in urban developments all contribute to stressed urban forests. In order to contribute to healthy, resilient communities, these valuable assets need to be managed proactively and supported consistently across the province. Green Infrastructure Ontario’s urban forestry toolkit is a set of documents that support those working to improve urban forest management across the province. This toolkit builds upon our 2015 report Ontario’s Urban Forests: Call to Action and was developed with input from professionals around the province. The first piece of the toolkit can help build the case for the value that urban forests provide as a municipal asset – with the goal of integrating urban forest management into municipal asset management plans. Read the bulletin on communicating the benefits of the urban forest in a municipal context HERE>>. The second document in our toolkit helps urban forest managers understand how urban forest assets fit into the municipal asset management planning process. 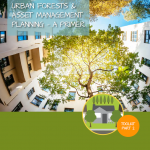 Read the urban forest asset managment primer HERE>>. Twenty years ago, the stretch of land between Lamoureux Park and the bridge to Cornwall Island was a brown wasteland where the natural ecosystem had been stripped away by industrial pollution. Then, in 1997, the Raisin Region Conservation Authority with funding from the Cornwall Rotary Club put in the rushing creek that exists there today in an effort to restore the original ecosystem. This area would then became known as the Rotary Eco-Gardens. Two decades later, on Sunday, Transition Cornwall+ Tree Action Arbre organized a guided tour of the eco-gardens with one of the scientists who originally spearheaded the project. Organizer Susan Towndrow said the walk was about admiring the handiwork of all the people who worked hard to revitalize the riverside ecosystem. Read Revitalized eco-system by Alan S. Hale at the Cornwall Standard-Freeholder.